VW is bringing the Tarok pickup concept at the New York Auto Show to “gauge market reaction”, testing the waters for an entry-level, compact pickup truck. 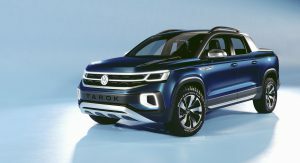 In some ways, a production version of the VW Tarok could prove to be a modern-day Subaru Brat for the US market, although the German car maker admits that there are currently no plans of launching it here just yet. 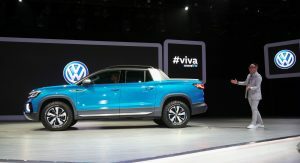 The VW Tarok concept made its world debut at the Sao Paolo International Motor Show, previewing a unibody pickup truck based on the company’s widely used MQB platform. 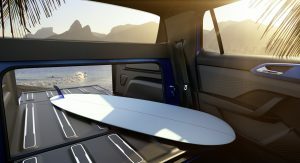 The concept measures 193.5 inches (4,914mm) long, yet it can carry loads up to 73.2 inches (1,859mm) long, thanks to its innovative bed design that enables it to extend into the cab. 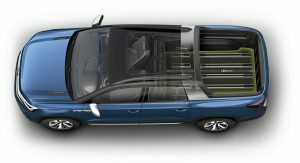 The compact Tarok is one of the largest MQB-based VW models, alongside the Atlas, featuring a 117.7 inches (2,989mm) long wheelbase and pretty short overhangs. 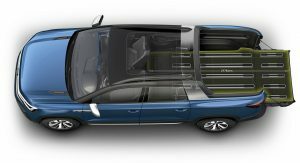 The bed offers a truly versatile floor space, which can be enlarged by not only opening the tailgate but also folding down the bottom of the cab’s rear panel. Payload is 2,271lbs (1,030kg). 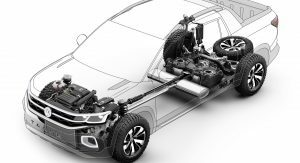 Power comes from VW’s 1.4-liter TSI engine, producing 147hp (150PS) and paired to a six-speed automatic transmission and permanent 4Motion all-wheel drive. 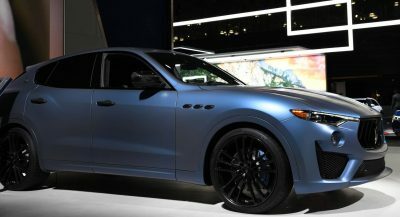 The latter can be adjusted via the 4Motion Active Control, a rotary knob used to activate four higher-level models (“Onroad”, “Snow”, “Offroad and “Custom Offroad”) and different pop-up menus. 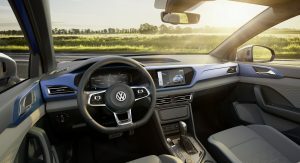 The interior is pure VW, featuring a digital instrument cluster and a glass-covered 9.2-inch infotainment system, as well as a removable speaker in the center console that can be individually connected to a smartphone via Bluetooth. Does USA need a compact unibody pickup truck like the VW Tarok? You’ll be the judge of that. Whatever the outcome, Brazil is set to get a production version of the Tarok pretty soon. That looks pretty production ready to me.. The small truck market it wide open. I’ll take a new small truck, and even more so if it’s a VW! So wait… Wheres the difference to the ruby red Single Cab VW Atlas Tanoak Concept from last year? Judging from the article the Tarok is a tad smaller than the Tanoak (which could be an Amarok successor but the Amarok successor will now be developed together with Ford). 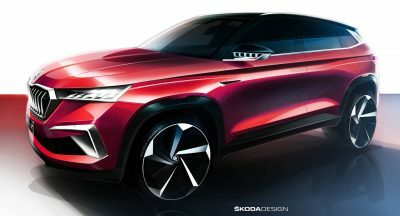 I really can’t keep up with VW pushing out that many SUVs (concepts) and Pick-Up concepts in the past few months. 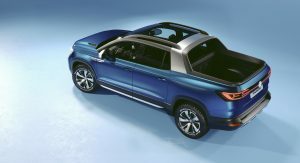 From what I’m getting, The VW Tarok is a smaller pick-up concept conceived for developing markets – primarily Brazil and other South American countries where the VW Saveiro (the current compact pick-up in VW’s stable) is available. 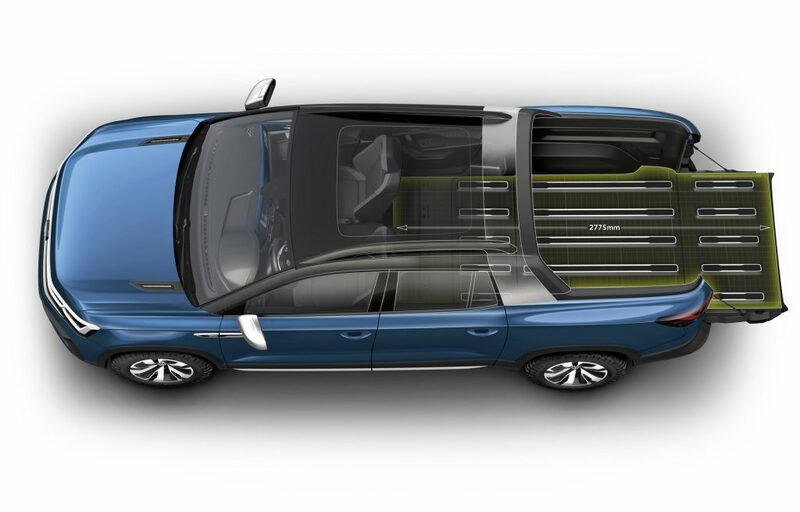 The VW Atlas Tanoak Concept (being based on the VW Atlas as the name suggests) will be a seemingly larger pick-up than even the current VW Amarok but still under the same class (to accommodate the ‘bigger is better’ tastes of the U.S. market). 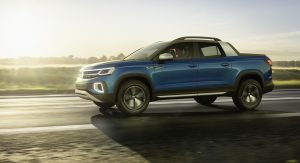 The VW Amarok will more likely remain a Eurocentric global vehicle for the current markets it’s already offered in though with the Ford partnership you mentioned, that might change things depending on how well the reintroduction of the Ford Ranger is received in the U.S. But yeah, it’s anybody’s guess what VW wants to do with their pick-up approach. Bring us the next gen Amarok or GTFO. I’d certainly be interested in a small pickup. Bring it on! Maybe, if it didn’t end up being an Atlas with a bed. INTERESTING THAT A CONCEPT HAS A RADIO DELETE PLATE. Hard to put a motorcycle in the back of this. thanks to its innovative bed design that enables it to extend into the cab. Ummm, the Chevrolet Avalanche had that same bed design in the early 2000’s, so not very innovative. 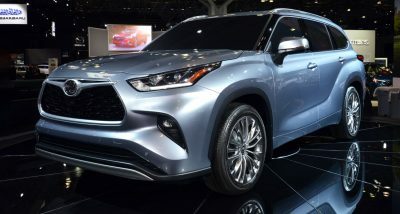 Too small for the American market. It needs to be a little wider. 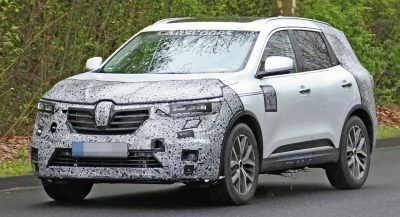 I can actually see this competing with SUV’s rather than other midsize pickups though, so it could be successful, but VW shouldn’t build this as a substitute for a proper Atlas-based pickup. They can sell both side by side, so long as the Atlas is not only a little bit bigger and wider, but also if it is a big more rugged. This will target women, subaru and honda owners, people who often haul home DIY craft supplies or furniture, or see themselves in that light, etc. Honda does a much better job at making their car-based pickup convincing as a truck by far. 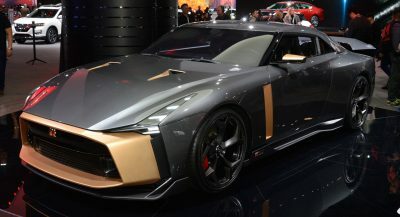 This looks like a grocery getter with its roof partially shaved off….no thanks!